"He's like an illusionist on the drum kit. It's effortless and entertaining, and he's just brilliant", is how JUDAS PRIEST legend Rob Halford once described his first visual encounter with San Antonio, Texas born and raised percussionist BOBBY JARZOMBEK. While best known for his 10-year tenure with Rob Halford, "The Metal God", with whom he has recorded a half dozen albums and DVDs and toured the world several times over, Bobby's resume is extensive and reaches back a quarter of a century ever since making his recording debut with hometown boys JUGGERNAUT on the aptly titled 'Baptism Under Fire' in 1986. Starting with the 1988's classic 'Thundersteel', Bobby became an integral part of NYC metal institution RIOT, an affiliation that continues to this day. In 1993, Bobby formed madcap prog/tech metal outfit SPASTIC INK with brother/guitarist Ron Jarzombek whose 'anything goes' approach spawned a sizeable cult following via a pair of mindboggling albums. 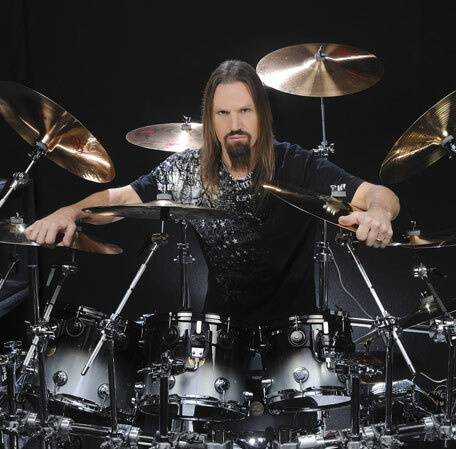 The ensuing years saw Bobby become a much in-demand studio and touring drummer in between HALFORD commitments, with acts such as ICED EARTH, DEMONS & WIZARDS, ROB ROCK and JOHN WEST utilizing his services. In 2006, Bobby was asked to join former SKID ROW vocalist SEBASTIAN BACH's band with whom he recorded 2007's 'Angel Down' and toured extensively, including various arena tours around the globe supporting Guns 'n Roses. Bobby has also been sitting behind the kit for progressive metal pioneers FATES WARNING for the past several tours. In 2000, Bobby was voted 'No.1 Drummer' by the readers of Japanese heavy metal bible Burrn! in recognition of his work on HALFORD's acclaimed 'Resurrection' album. He also caught the ears of America's premier drum publication, Modern Drummer, who called HALFORD's blazing sophomore release, 'Crucible', "a stunning slab of metal, and Bobby Jarzombek's drumming is a prime reason. On propulsive scorchers like 'Betrayal', 'Heretic' and 'Handing Out Bullets', the drummer shows astonishing power and precision. The Metal God knows how to pick 'em." SPASTIC INK's 'Ink Compatible' elicited a similar rave from Drum! Magazine: "Bobby Jarzombek is a monster to pull off this kind of dexterous drumming. He wades through the breathtaking linear patterns and riffs of 'Just A Little Bit', and the ridiculous 11/16 grooving and instrumental call-and-answers of 'Multi-Masking'." This multi-format collection includes grooves formatted for BFD3®, BFD2®, BFD Eco®, EZDrummer®, Superior Drummer®, Addictive Drums®, Accent, Cakewalk® Session Drummer™, Steven Slate Drums 4 as well as General MIDI Standard MIDI Files which can be used with any GM compatible drum software or hardware --- this includes drum machines and synthesizers which have drum sounds. Platinum Samples are one of the foremost producers of drum samples in the world, with over 50 years of experience in the professional music industry. The Bobby Jarzombek Metal MIDI Groove Library was recorded over a two-day session by Bobby Jarzombek on a Yamaha DTXtremeIII Special electronic drum set.